Please note, unless otherwise specified, the rotations blocks are each 4 weeks. The San Joaquin General Hospital's Family Medicine Residency Program is structured to train thoughtful and caring physicians to be prepared for a diverse scope of practice in the field of family medicine. Our patient population is the underserved in San Joaquin County. Our residents see a broad range of pathology. The principal strength of San Joaquin General's program is the autonomy afforded to our residents in both the outpatient and inpatient services. On the outpatient services, residents rotate through our FQHC qualified clinics including our own family medicine clinic, sports medicine clinic, procedures clinic, geriatrics clinic, pediatric, and psychiatry clinics. On inpatient rotations, residents are responsible for acute care of all ages and at all stages of life including the intensive care nursery, labor and delivery, ICU, and the family medicine inpatient service. Experience gained from direct patient care in both outpatient and inpatient settings are complemented by morning and afternoon conferences which range from case-based interactive discussions, to formal resident and faculty presentations, Jeopardy, and to even teleconferences with the University of California, Davis Medical Center. Our focus on education for our residents is not limited to only our campus. Electives are also available for our residents through our affiliation with the University of California, Davis Medical Center network. Below, you will find more detailed information about each of our rotations. Our residents typically rotate through four week blocks, for a total of 13 rotations each academic year. In the beginning of residency, there is a larger focus on inpatient medicine. Toward the end of residency (PGY-II and III), our residents spend the majority of their time in our outpatient clinics. Throughout all three years, residents rotate through several two week blocks of night float which covers all inpatient services (inpatient adult, inpatient pediatrics, labor and delivery, and the intensive care nursery) and admissions from approximately 6pm to 6am (more details on night float at the bottom of the page). Residents take "call" providing cross-coverage to our inpatient teams and admitting, on a varying basis depending on their current rotation and their current post graduate year. 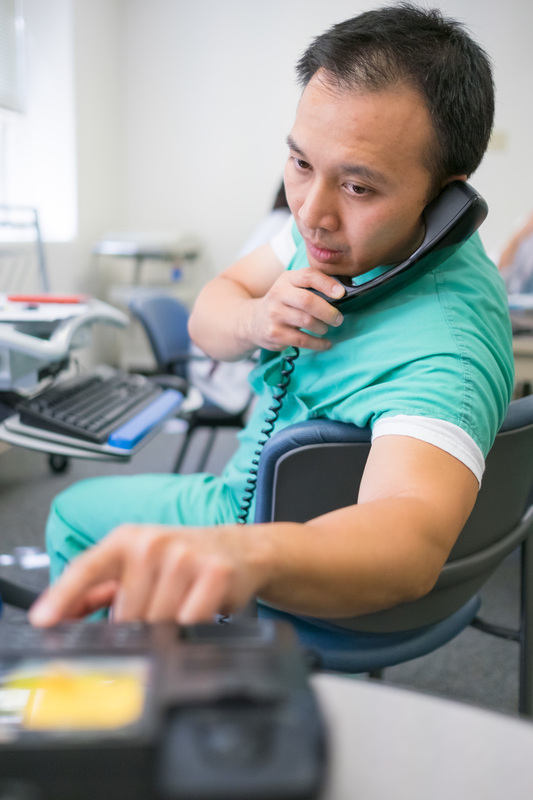 As an intern (PGY-I), the calls are ≤ 16 hours, and on average 1 – 2 times per month when on outpatient rotations. As a PGY-II and PGY-III, call shifts are ≤ 24 h + ≤ 4 h for continuity and transitions of care, on average 1 – 2 times per month when on outpatient rotations. When our residents are on the inpatient adult or inpatient pediatric service, call is every 6th day. The Family Medicine Inpatient Service at SJGH provides care to acute adults who are hospitalized. Patients are admitted from our clinic and the SJGH Emergency Department. Our inpatient service is staffed by a family medicine attending physician (rotating on a weekly basis), one senior resident (either one R3 or one R2), and one intern. A clinical pharmacist, pharmacy students, and 2-3 medical students are also on service most of the time. Our inpatient teams care for patients with a high level of complexity (as expected in a safety net hospital) which includes sepsis, congestive heart failure exacerbation, acute gastrointestinal bleeds, as well as complications of chronic diseases, such as diabetes, hypertension, and cancer. We share a collaborative atmosphere with both the surgical and internal medicine residency programs at our community hospital who help to co-manage complex patients. When our patients need more intensive care, our patients are transferred to our ICU where their care is coordinated by the internal medicine team and the family medicine resident who is currently rotating through the ICU. Our ICU operates on a "closed" system which means when a patient is sent to the ICU, we no longer follow them until they are downgraded from the ICU. Under the guidance of the attending and senior resident, various invasive procedures are performed on service, including: thoracentesis, paracentesis, lumbar puncture, and central line placement. There are two inpatient adult family medicine blocks during intern year and one block in the subsequent years of training. The inpatient pediatric service at SJGH provides acute inpatient care to our pediatric population, ranging from newborns to adolescents. Our pediatric service is staffed by a pediatric attending physician (rotating on a weekly basis), one senior resident (either one R3 or one R2), and one intern. Typically there are also 2-3 medical students on the service most of the time. Our pediatric attendings are dedicated to teaching and have a dedicated weekly morning report for pediatric didactics. Our inpatient pediatric teams care for patients with a broad range of complexity, ranging from phototherapy for hyperbilirubinemia to managing complications in patients with cerebral palsy, and sepsis. Our residents become skilled and confident in managing common bread and butter pediatric disease such as dehydration, asthma, RSV bronchiolitis, and neonatal fever. In addition to managing the care of pediatric patients, the inpatient pediatric team is also in charge of admitting to the intensive care nursery, pediatric inpatient, family medicine inpatient, and labor and delivery services during their shift. Invasive procedures typically include lumbar puncture to work up septic neonates. In addition to training received from our hospital, our residents also spend time with child protective services to learn more about how they can help our young patients. There are two inpatient pediatric medicine blocks during intern year and one block in the subsequent years of training. All residents are given a patient panel, where they care for their own personal population over the course of their three years at San Joaquin General. Our FQHC clinic also features a walk-in clinic which PGY-II and more senior residents learn the aspects of urgent care and when to send patients to the emergency department or when to be admitted. In addition to this, residents also participate in longitudinal ambulatory experiences in behavior science and psychiatry. The responsibilities for our residents increases with their seniority. During the intern year, residents have only half a day each week for their continuity patients in the family medicine clinic. This increase to one full day a week for second years and third years. The census during the continuity clinic also progressively increases with seniority as well, with new interns initially seeing about 2 patients in half-a-day, to about 7-9 for the more senior residents. Preceptors from both the community and core faculty actively teach our residents during their clinic to utilize evidenced based medicine. Continuity clinic is usually at least once a week, with clinic time increasing with seniority. Our residency program is more inpatient medicine focused at the start of residency (PGY-I), and more outpatient focused toward the end of the residency program (PGY-III). All interns will gain experience in obstetrics through two, four week-blocks in our unopposed labor and delivery floor. We are the only high-risk delivery labor and delivery unit in the county, providing us a great deal of complexity and experience usually only seen in tertiary centers. In addition to training on the labor and delivery service, we also spend two full days with other family medicine residents in the UC Davis network to train in the family medicine ALSO (advanced life support in obstetrics) course. Our residents easily make the requirements for the number of both vaginal and Cesarean deliveries at our hospital under the guidance of our obstetrics-fellowship trained family medicine attending and the supportive obstetricians & midwives. Our residents serve as first-assist for Cesarean sections as the obstetrics and gynecology service does not have residents. At the end of the two blocks, our residents not only gain experience regarding the bread and butter of obstetrics, but also gain exposure to high risk patients, multiples, ultrasound, operative vaginal delivery, and perineal repair. After two blocks of obstetrics and the ALSO course, our residents can then begin taking care of continuity prenatal patients. These prenatal patients give the resident the opportunity to care for the mother prior to pregnancy, during delivery, and after delivery along with the newborn. There are two blocks of obstetrics during the intern year, each lasting 4 weeks. After completion of the two obstetrics blocks, the resident becomes eligible to take care of their own continuity prenatal patient, for which the resident will be responsible for prenatal, perinatal, and postnatal care for the mother. Under the guidance of our sports medicine fellowship-trained attending, we learn to develop clinical skills to prevent and manage sports-related injuries, as well as common musculoskeletal injuries in our family medicine patients. We rotate through a weekly sports medicine clinic on this rotation, focusing specifically on our musculoskeletal exam for diagnosis, and procedural training including joint injections. During this rotation, we also spend time with our orthopedic surgeons in their clinic and in the operating room as a first assist. In addition, we spend time in the casting room learning how to apply casts. Our residency program is responsible for providing sports medicine coverage for Stagg High School's football team. On Fridays, during football season, we are on the sidelines to intervene when there are any sports-related injuries. We also help our local community college with sports physicals. This rotation lasts for 4 weeks and is present in each year of residency. During outpatient rotation residents frequently participate in dedicated psychology and psychiatry clinics, seeing patients along with an attending psychologist and psychiatrist. 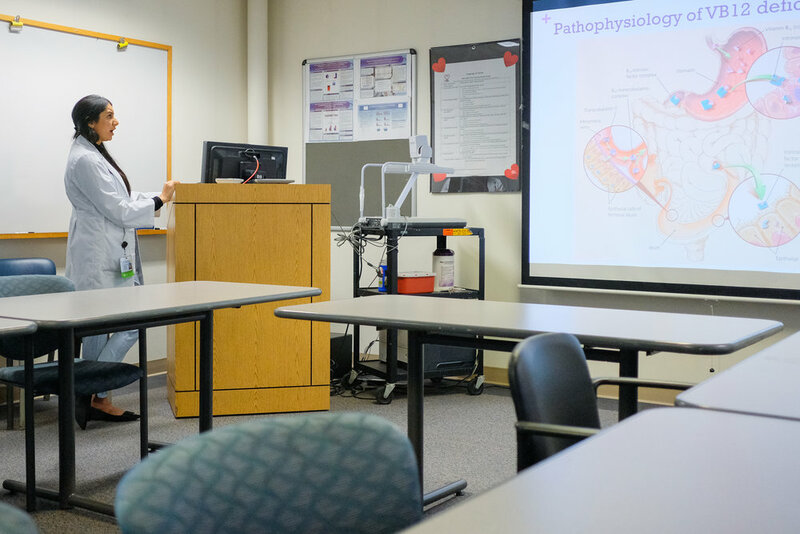 First-year residents are taught the basics of clinical diagnostic interviewing as well as evidence-based treatment for mild-to-moderate psychiatric disorders. Second- and third-year residents rotate more frequently with the attending psychiatrist and learn comprehensive psychopharmacology care for the more complicated patients. In addition, learning is facilitated through a seminar-based psychology workshop, where residents can get help with challenging cases and learn treatment techniques and interviewing skills. An emphasis is placed on teaching motivational interviewing to help the resident to have effective tools in motivating the ambivalent patient to positive behavior change, be it for a mental or substance use-related condition or for a medical condition such as chronic pain self-care. Our mental health education spans the entire length of our residency, usually with several days out of the week dedicated to psychology and psychiatry clinic during our outpatient rotations. In addition to our own gynecology clinic in our family medicine clinic, we spend a month with gynecologists in their outpatient and procedure clinic. We learn the all aspects of care for women including a family-oriented approach to common women's health issues. We learn about the common clinical problems in the ambulatory setting. In addition, we learn to perform pelvic exams and procedures with proficiency and skill. The focus of this rotation is to develop competence in the Well Woman Exam which includes performing appropriate breast and pelvic exam, identifying normal and abnormal exams and appropriate evaluation for abnormal exams. This rotation lasts for 4 weeks and is only part of the PGY-III rotation schedule. During the PGY-II year, our residents work alongside the internal medicine residents in the adult intensive care unit to care for critically ill patients. Our ICU is a closed system (patients who enter the ICU have their care taken over by a designated ICU team). During this rotation, invasive procedures are practiced and refined including: arterial line placement, central venous catheter placement, lumbar puncture, thoracentesis, and paracentesis. Our residents also spend time learning how to use the ultrasound to help with fluid management, procedures, and detection of DVTs. In addition, our residents gain valuable experience with family discussions under the supervision of the ICU attendings. Under the guidance of our geriatric medicine fellowship trained family medicine attending, our residents spend a majority of their time in clinic, learning about the geriatric assessment, learning to maintain older adults in the community at the most independent level as possible through an interdisciplinary family medicine approach. We also gain exposure to long-term care including skilled nursing facilities, and rehabilitation centers. In clinic, we also work closely with our neurologists and psychiatrists in the diagnosis and treatment of dementia, and psychiatric disorders in the elderly. We spend time with a local hospice to learn about hospice care at facilities and at a patient's home. In addition, we also spend time taking care of skill nursing facility patients by answering calls to the SNF pager. This rotation lasts for 4 weeks. This rotation is present during the PGY-II year. This four-week rotation provides our residents a cardiology experience in the inpatient and outpatient setting. For most of the rotation, our residents work one-on-one with the attending cardiologist at our hospital. Our residents serve on the inpatient consult service and are the first contact for patients with a variety of cardiovascular diseases including acute coronary syndrome, acute decompensated heart failure, and arrhythmias. In the inpatient setting, residents are taught how to evaluate ejection fraction, how to read EKGs, and how to utilize the best pharmacotherapy for our patients. In the outpatient setting, residents will participate in management of chronic conditions in the cardiology clinic, congestive heart failure clinic, and in the pulmonary hypertension clinic. Our residents participate in cardiac procedures including stress testing, electrical cardioversion, and even temporary transvenous pacemaker placement. We care for those in our community and this rotation serves as a way for our residents to learn about how communities affect patients. Residents learn to engage with their communities by giving presentations and educating the community about primary and secondary prevention. Residents also visit community agencies such as our community lead screening program and Child Protective Services. This rotation sheds light on the importance of the social determinants of health. Residents rotate through the emergency department during their second year for 2 weeks and third year for 4 weeks. Our emergency department is the only level III trauma center in our county. Our residents are supervised by attending physicians in the department of emergency medicine. As the only trauma center in our county, our residents are exposed to a wide variety of cases. Our residents also are able to perform many procedures while on their emergency medicine rotation including: central venous catheter placement, paracentesis, lumbar puncture, and laceration repair. This rotation helps our residents develop their clinical knowledge in the diagnosis and treatment of emergent medical conditions. Procedures in family medicine are an integral part of our residents' future practice of medicine. In addition to the invasive procedures our residents perform while on the inpatient services, we have a dedicated procedure clinic in the outpatient setting. We have made it easy for our residents to get additional skills during their residency in our procedure clinic for: circumcision, implanon placement, IUD placement, skin lesion removal, paracentesis, and endometrial biopsies. We also have a dedicated family medicine-run gynecology clinic in addition to our general procedure clinic. Our procedure clinic is for our PGY-III residents. Residents care for critically ill neonates in the intensive care nursery and work directly with neonatologist attendings. During the 2 week block, residents admit and care for the neonates transferred to the nursery as well as go to the labor and delivery floor to triage and manage sick newborns. Residents are exposed to: the septic workup, drug withdrawal, infant of diabetic mothers, hypoglycemia, and other common conditions in our level III nursery. One of the smallest surviving babies was born and taken care of in our intensive care nursery. During this 2-week block, residents work with pediatricians in the newborn nursery learning the general newborn physical examination. Residents gain experience in learning about screening tests and what to do with abnormal findings in newborns. Training is provided by the general surgery department with emphasis on diagnosis, management, and timely referral for surgical evaluation. Residents are under the supervision of the Department of Surgery and they work alongside the surgical residents. Duties include both the inpatient surgical service and the outpatient surgical clinic. Residents are able to achieve competency in the diagnosis and management of a wide variety of surgical problems encountered by family physicians. Operating room experience is encouraged but not required. In addition, our residents are involved in the trauma activation team during their 4-week block, affording them direct experience in trauma care. Our program uses a "night float" system to cover our inpatient services during the evening and early morning hours. These night float rotations last for two weeks and involve admitting and cross-coverage for inpatient adult, inpatient pediatric, intensive care nursery, and the labor & delivery services. The night float team typically consists of a senior resident and a junior resident who work as a pair. The on-call attending is always available to back up our residents. The night float rotation allows for our residents to strengthen their self-sufficiency and their ability to triage across a broad range of services. Modernized on-call rooms are present for the residents during this rotation. There are two, two week-night float blocks, and a single week block in the first year, three night float blocks in the second year, and one night float block in the last year of residency. Night float is typically from 6pm to 6am, from Saturday to Thursday. We offer our residents opportunities for elective rotations in their PGY-II and PGY-III years. Four week blocks are available for our residents to custom-tailor their educational experience to their future practice. Residents can choose from many of our home electives or the vast amount of electives within the UC Davis Medical Center system. Unfortunately, international electives are not available at this time. Off-site rotations are available if the resident is able to arrange their own malpractice insurance for the elective. During our PGY-II and PGY-III years, our residents have 2-week blocks of time which can be used for outpatient adult or outpatient pediatrics, depending on which additional experiences are desired by our residents.